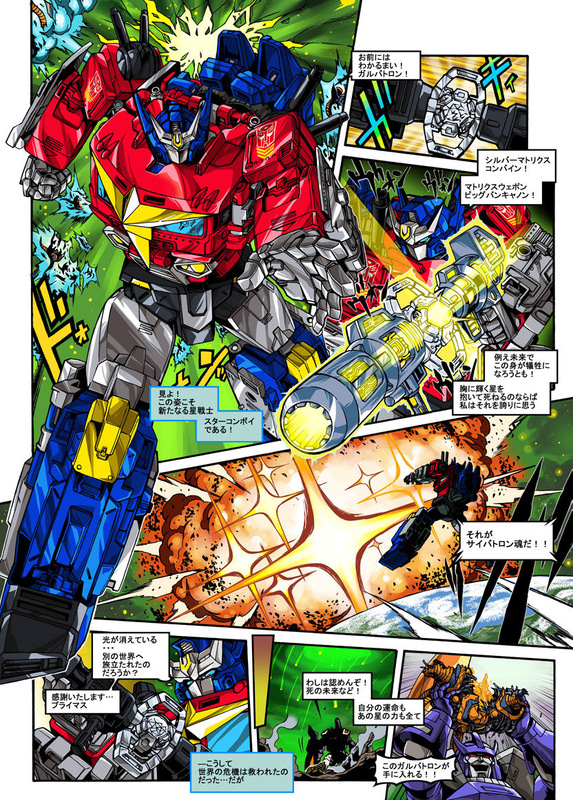 Takara Tomy Mall has just uploaded the Transformers Generations Select Star Convoy Web Comic/Manga on their listing for the toy. This time is a very short 2-page story that features G1 Convoy (Optimus Prime) and Galvatron facing Unicron and some strange creatures. Convoy (Optimus Prime) transforms into his Star Convoy form combining his Matrix with his blaster (a gimmick seen in the toy) to finish the enemies in just one shot! You can download the pdf file here or you can check out the mirrored images after the jump. Then sound off on the 2005 Boards! In the last LG-EX manga, Dai Atlas killed Super Megatron. I’m sure there’s gonna be at least some kind of concluding story, because there’s no way they’re going to leave Megatron dead. Not to mention that the Legends world needs to be rebuilt. Yeah true. There’s no real certainty. I’m just spitballing. Really? Well okay. Star Convoy is select so I wouldn’t be surprised if Micron Legend Convoy was in Selects series as well. Like Jalaguy said, there will probably be a final story to tie everything together. Yeah, Takara is very clearly done with the Legends toyline. If they weren't, Star Convoy, Turtler, etc. would be LGEX releases instead of Generations Select. I imagine there'll be one last online manga at some point to wrap off the story and then that'll be it for Legends. Well we knew from the brand deal it’d be ending. I’m pretty sure the manga is done as well. Sadly. It’d be cool if there was one with all the siege figures. It didn't have LG-EX. Just S-Convoy and A-Convoy. Really? Well okay. Star convoy is select so I wouldn’t be surprised if Micron Legend convoy was in select series as well. I do miss him. I’m pretty sure the name plate had LG-EX on it as well as star convoy. Might be easier said than done since Super Megatron is looking to be an extensive retool of Titans Return Galvatron who doesn't have a core bot gimmick a la Star Convoy. They can retool the headmaster into Galvatron. So matrix in the weapon intended? Given that it was remolded to have the pegs to connect both weapons, I would imagine it's very very intentional. I forget, is the upcoming Armada/Micron Legend Convoy going to be an LG-EX release? Hopefully Sakamoto will be back for the manga if it is. This manga isn’t all that great, whoever wrote it. The Legends line in general are done and over with. We STILL don't know what's the deal with the Armada Optimus Prime toy we saw a few months back. Even though the main Legends line is done (finished with LG-66 Topspin last year), TakaraTomy Mall still occasionally unveils LG-EX releases, like the Big Powered set. And Sakamoto still does the manga for them. I originally thought both Star Convoy and Armada Prime were going to be LG-EX releases, but obviously Star Convoy wasn’t. 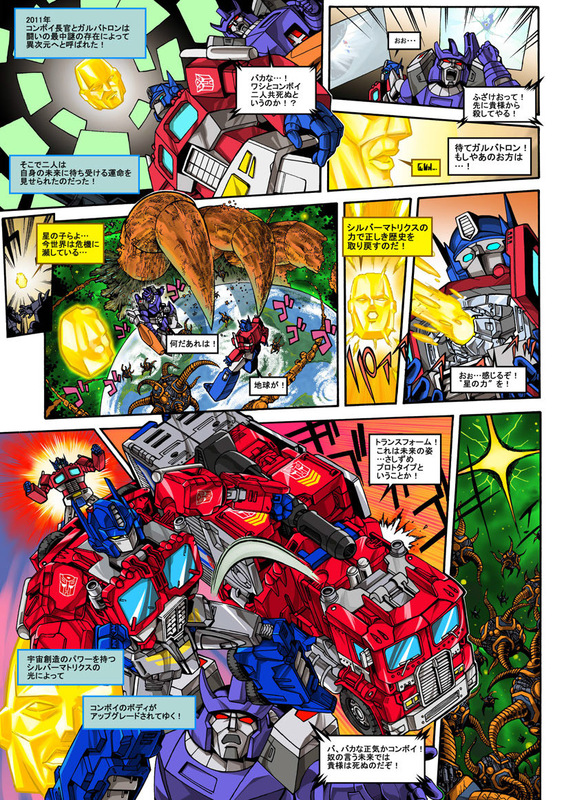 I just found it odd that the Powered Convoy Legends manga went out of its way to show Prime and Megatron again returning to their Star Convoy/Super Megatron bodies, and yet the new Star Convoy toy’s manga has nothing to do with that storyline and doesn’t even take place in the same time period. I wonder if they would have a Galvatron core bot and Super Megatron be the combined mode. So I guess the last panel teases Super Megatron? I wonder if they would have a Galvatron core bot and Super Megatron be the combined mode. Nice to see YHVH is still getting work.